Banging the drum in Sloane Square underground station. Homeless Bucket Drum Busker Living On The Streets Of London. 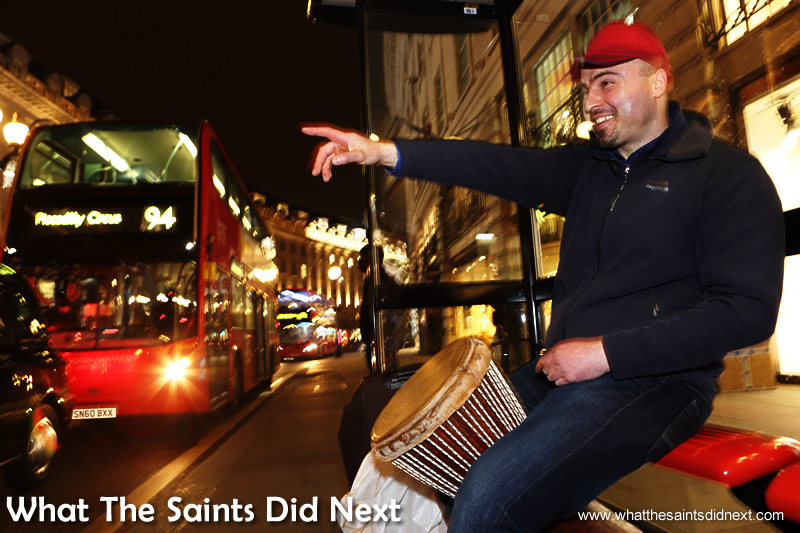 Sitting on an up-turned bucket with a homeless bucket drum busker on the streets of central London, UK, attracting curious looks from tourists and shoppers, is an unexpected, new experience for me. 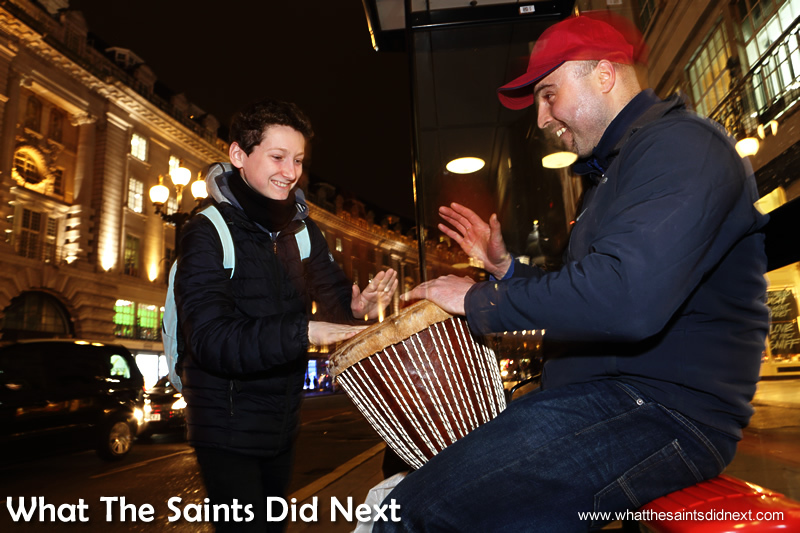 Sharon and I are with 36 year old Dan Ground, originally from Paris, France, but now making a living on the streets of London for nearly 15 years, singing and drumming with plastic buckets. 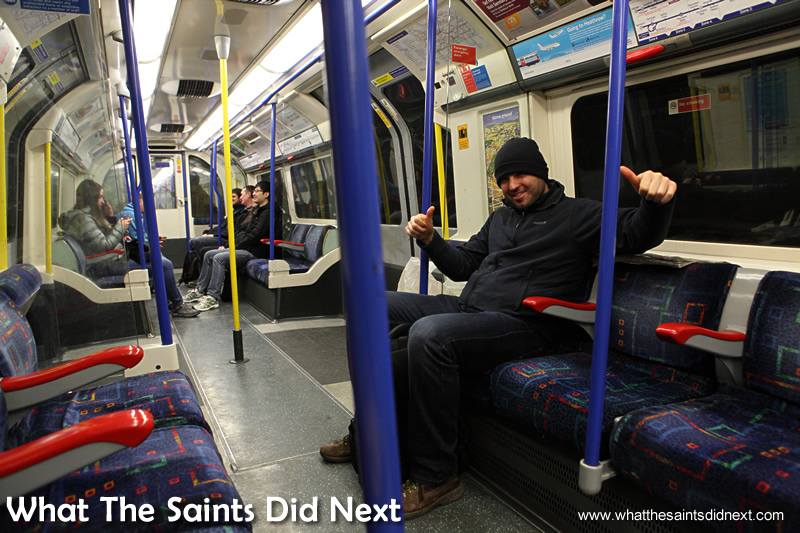 We first met two days ago when Dan saw me taking pictures on the underground. 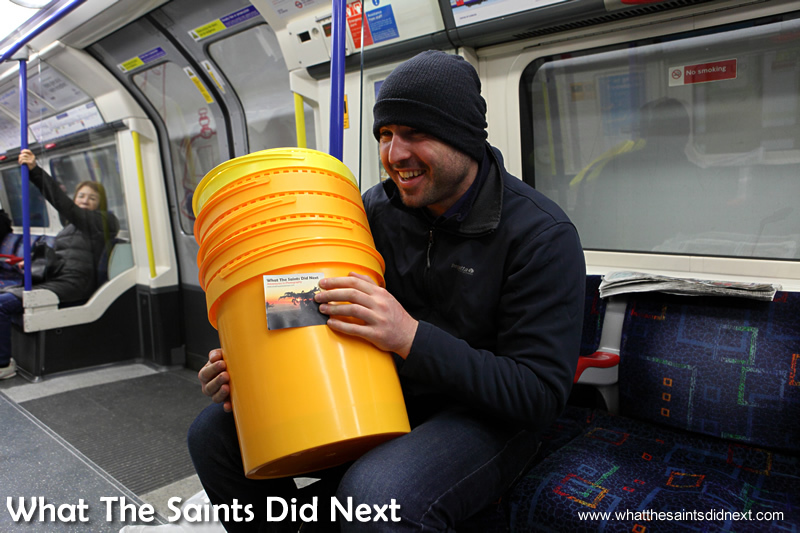 We got talking; I told him about ‘What The Saints Did Next’ and he told me about his musical buckets. 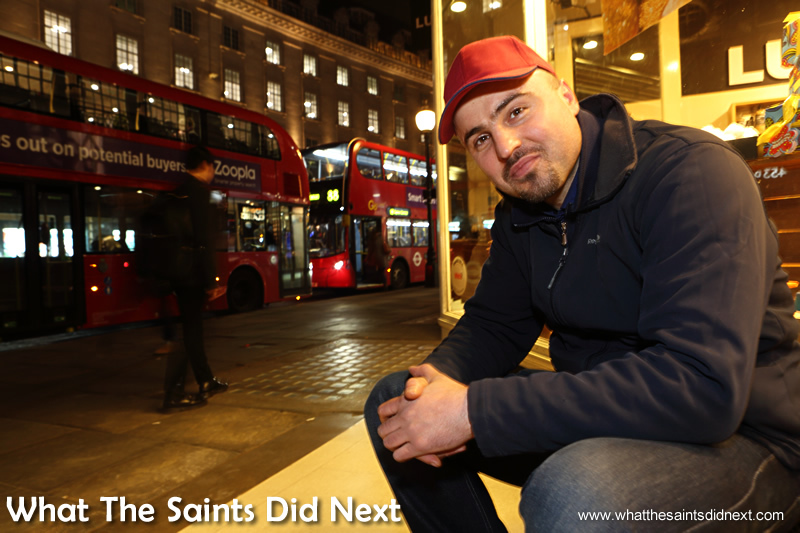 After swapping phone numbers, two days later we met up in Sloane Square underground station on the westbound platform where Dan was going to play. The moment I met Dan – a pose when he saw the camera. Homeless Bucket Drum Busker Living On The Streets Of London. Dan shows me his buckets at our first meeting. Homeless Bucket Drum Busker Living On The Streets Of London. 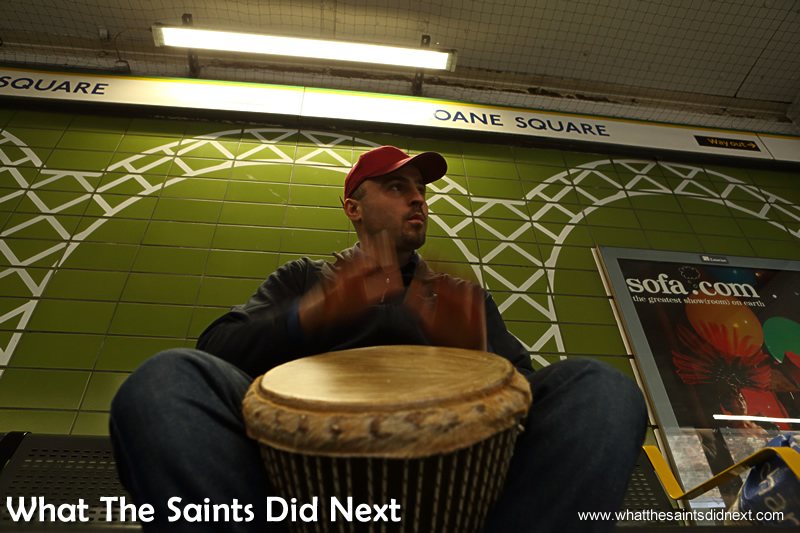 Unlike our first meeting, this time Dan was loud; singing across the platform while banging his djembe drum. I have to admit this was a bit unsettling as the station platforms were full of people waiting for the train in that typical, silent, ‘don’t make eye contact’ manner that exists on tube. Heads turned to see the commotion we were walking into. Sharon, bless her, shrank away, partly due to embarrassment, partly a little frightened. Dan’s a big guy and a little intimidating initially, but luckily I recognised this as his showman persona. The station filled and emptied as trains came and went, and all the time Dan knocked out rhythms on the djembe to improvised lyrics loudly directed at the various travellers. Most people quickly looked away, a little self conscious they’d been targeted by the musician. In full flow and voice, as the crowd on the opposite platform look on. Homeless Bucket Drum Busker Living On The Streets Of London. Dan told me he fell in love with London. Over the years he has adapted to living and surviving in the capital, often benefitting from the generosity of friends’ sofas for the night, but admits, “I still don’t have my own house,” and continues at times to sleep outdoors. He did say though, that the idea of owning something, such as a house, doesn’t appeal to him. 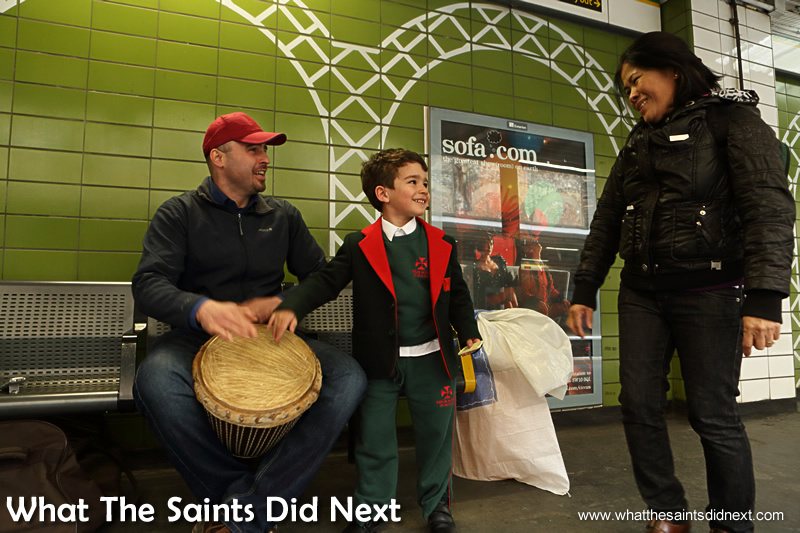 A young boy heads straight for the drum and much to his delight Dan lets him have a go. Homeless Bucket Drum Busker Living On The Streets Of London. Last month he auditioned on the TV show, X Factor, but told me he was “buzzed off” by the judges at the first attempt, although Simon Cowell didn’t buzz. Our Sloane Square meet up had taken place earlier in the afternoon. Now we were on Regent Street after 7pm outside the handmade cosmetics shop, Lush. In contrast to earlier, Dan arrived subdued, although happy to see us. He gave me a tour of his ‘street corner.’ He normally waits until the shop is closed before settling in to play, but tonight the shop isn’t closing until 8pm, which is how I’ve ended up on the bucket. I’m surprised to learn Dan is usually anxious every time he is about to play. He thumps a clenched fist against his chest to mimic a nervous heartbeat. Sitting down in order to feel the vibe from the street. Homeless Bucket Drum Busker Living On The Streets Of London. “I sit for maybe an hour before I begin to play,” said Dan. “It allows me to calm down, feel the vibration of the street and then after a while I own this part of the street. It becomes mine.” It’s clear there is a real psychology to this way of life. Dan has accidentally left his drum sticks behind so offers to play the djembe instead. And, he begins to get loud again. Bit by bit his voice amplifies until he is engaging with anyone who looks our way. The city lights provide a sparkling backdrop for Dan’s performance. Homeless Bucket Drum Busker Living On The Streets Of London. Another youngster is drawn in by the music and once again Dan allows him to have a go on the drum. Homeless Bucket Drum Busker Living On The Streets Of London. The energy is palpable; there is an incredible buzz in the air. The night is lit up by the glow of street lamps, headlights and reflections, engine noise, horns being sounded, people chattering as they walk by, footsteps on the pavement, the rumble of suitcase wheels on the go, a police siren… I guess we have added to the spectacle with the camera and the flash going off repeatedly. At one point it seems we are surrounded by people; curious onlookers, but many just waiting for the next bus. I feel as though I’m part of Dan’s team, him with the djembe and me with the camera, and I realise I’ve become intoxicated by the attention – it feels good! 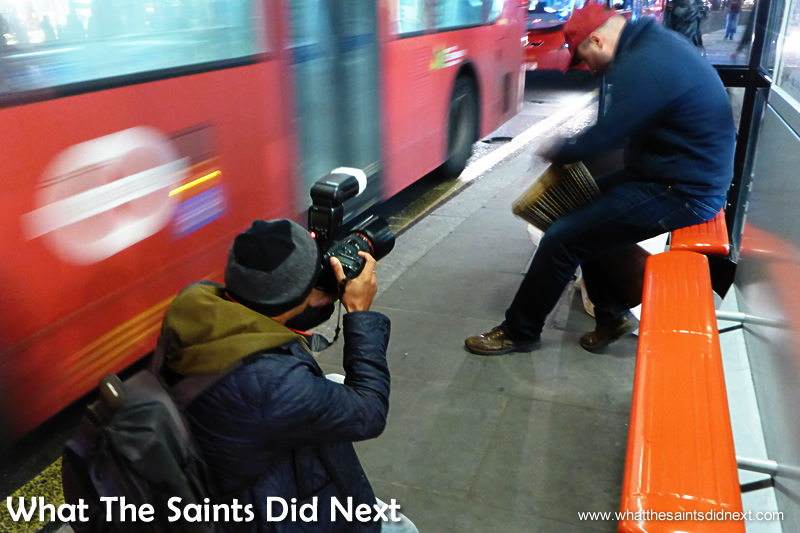 Photographing the street musician. Homeless Bucket Drum Busker Living On The Streets Of London. 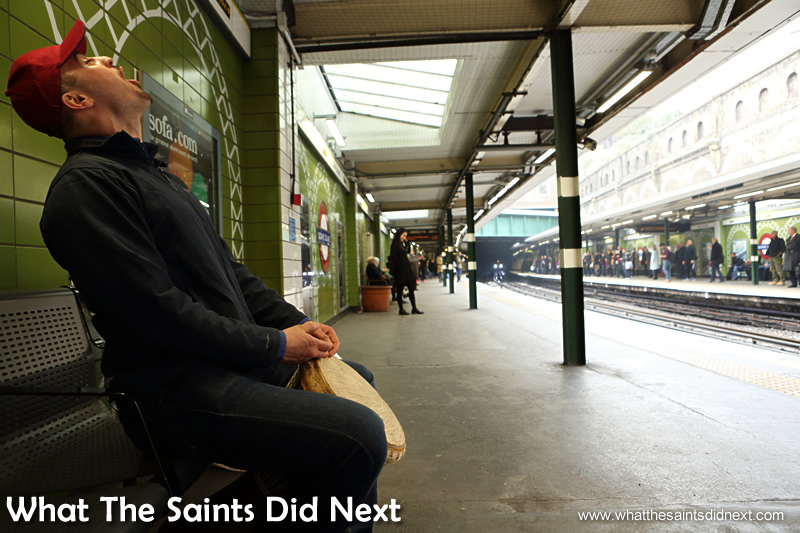 Because of Sloane Square station earlier in the day I understand exactly what Dan means. He is right; earlier there was a tension, but tonight on the open street was exhilarating. I got to experience a special little behind-the-scenes look at an aspect of London that most people only see from the tourism side of the fence. And I got to meet the free spirit that is Dan Ground. “Hey pretty lady, I see you smiling at me. 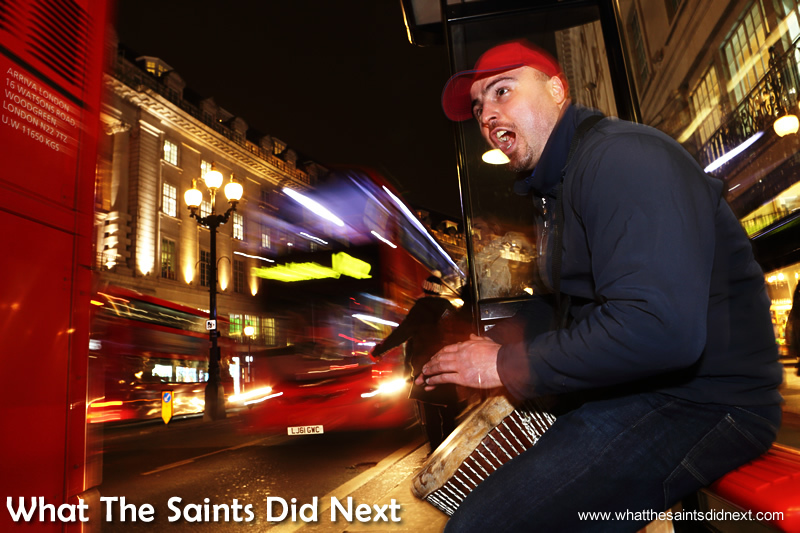 I’m smiling at you, yes you, I see you too…” Homeless Bucket Drum Busker Living On The Streets Of London. Very interesting story. It’s nice to know how other people live and survive. So worth the wait :). Another amazing story. You guys making wish I could have another holiday to London now. Thanks guys, glad you like this story. It was a wonderful experience, helps us appreciate London a little bit more. Love this! I sometimes wish I could spare the time to stop and have a chat to people on the street, but I get caught up in the rat race and just give them a glance or some change. They deserve more. Fantastic story! I guess every busker has a deep story to tell! A pretty amazing story, don’t think I would live homeless, but deeply thinking about it most of us value materialism. He maybe living just as good and happier. Cheers Borbs, thanks for the feedback. We certainly didn’t get any negativity from Dan, just a real sense of sharing the fun of what he does.